My weekly shopping trip to Target just got even better! 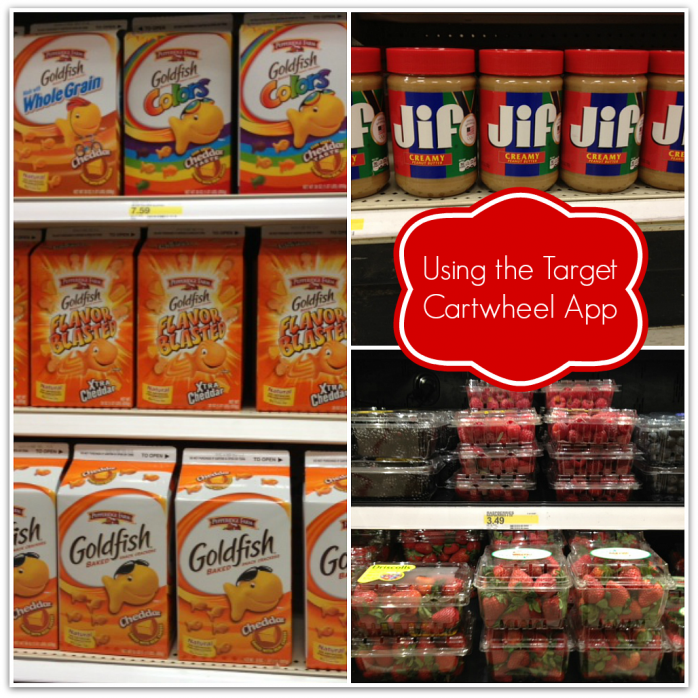 I started using Target’s Cartwheel App to save time and money. It’s really simple to use and I love saving cash on items I buy all the time. You just 1. Choose Your Savings, 2. Go To Target and 3. Scan and Save. Here’s how my I used the Cartwheel App this morning. I started planning my trip to Target while at home, still wearing my pajamas. I have sort of “laundry list” of groceries I buy each week. 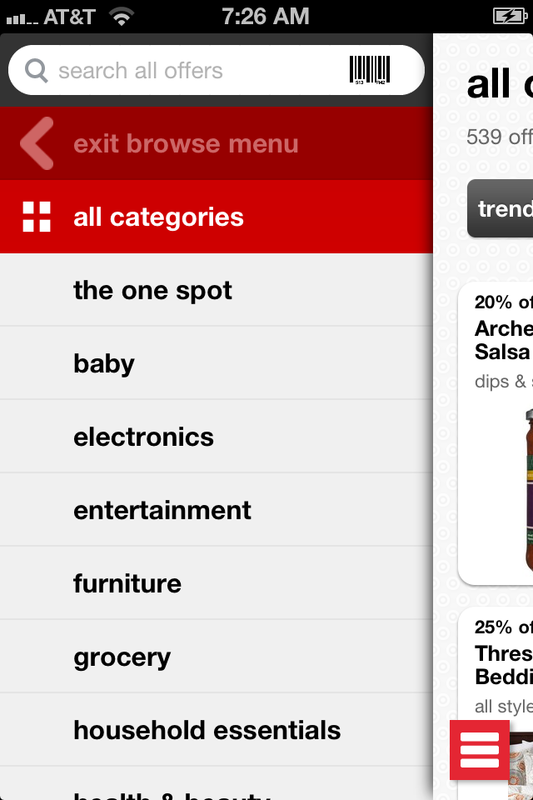 Knowing what’s usually on that list, I downloaded the Target Cartwheel App to my iPhone. 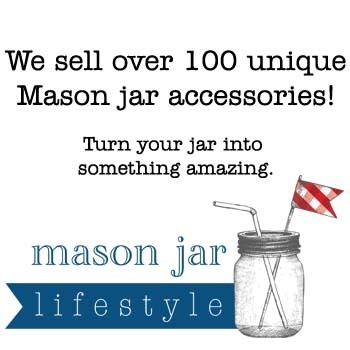 You could also use the app on your desktop, tablet, mobile phone or Droid. I’m no tech whiz, and luckily the app is extremely easy to download. In no time at all, I was perusing the deals. 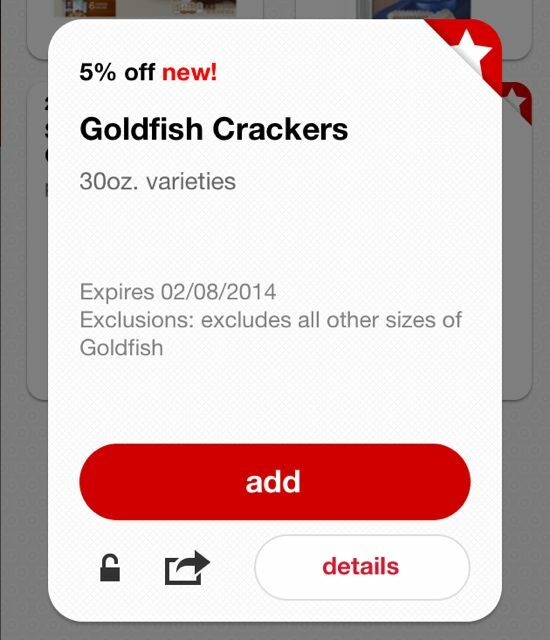 A couple of details about Cartwheel– there are over 700 offers/coupons on Cartwheel and they can only be used on in-store purchases. Back to my shopping trip. I saw many of the items I was already planning on buying had a coupon on Cartwheel. Yay! I added the Goldfish Crackers offer with a simple tap and keep shopping for deals. Next up… it was time to score more offers! 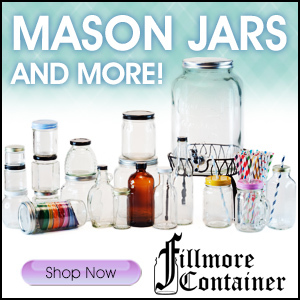 I found deals on peanut butter, water, clementines, berries, rice cakes and so much more! I added all the deals and got this on my phone… a mobile coupon. That’s right, just one mobile coupon that works for everything. SUPER COOL! I headed into Target to grab my groceries. I easily located all the things I had found offers for. Here’s another neat feature of the app. You can “stack” coupons and discounts. That means in addition to the Cartwheel App offer, other Target discounts, coupons, manufacturer’s coupons and even your REDcard discounts apply. The app makes saving money a breeze. Then it was time to pay and use my single scan barcode to save some cash. The checker scanned my coupon and BAM… saved more than ten dollars off my grocery bill. WOO HOO! And I have more exciting news. 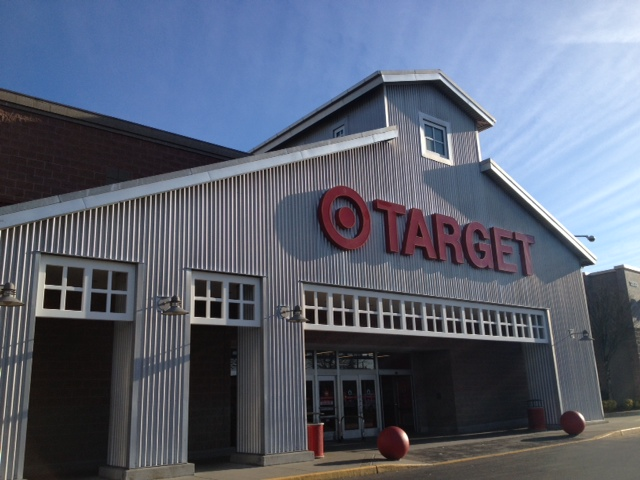 You could win a $1,000 Target GiftCard®! Answer the question: “What is your favorite feature of the Target Cartwheel app?” for a chance to win! I like that you can combine it with manufacturer and store coupons. Two words — mobile coupons — I love it!! I love my Cartwheel app!! My favorite feature is the ability to stack coupons! I love that you can use coupons with it and you can scan any item and it will show if there is an offer available. I love that Cartwheel lets you stack coupons on top of things already on sale. I love finding all the items I’m already buying on cartwheel and the extra spots I earn when I save a certain amount. Combined with store coupons manufacturers coupons and the red card saves me so much!! I would love the mobile coupon feature. I tend to print or cut coupons then leave them at home when trying to head out the door. i like stacking coupons i love to SHOP and save money so i know this app is for me ! ! How nice! So much easier than clipping coupons! I haven’t tried it yet, but I will this weekend!! I like that you only have one barcode to scan for all of the coupons – keeps it easy! Love the cartwheel app. I love that it gives you alerts when new stuff has been added! I love that it lets you stack the coupons, I’ll have to download this app because I go shopping at Target a lot. I love that it includes coupons for things I already buy! I like that you can get all the coupons to combine and match. I like that you can use both Target & Manufacturer coupons together. I like that you can combine it with manufacturer coupons. I love how you get to decide which coupons you use. Unlike the ones which print out from the register, which are sometimes completely useless to me. I love the crazy high amount of coupons they have! This app sounds easier than cutting out coupons each week from the paper and remembering to bring them with you when you are shopping. I love that they update what is on cartwheel on a regular basis. I can save EVEN MORE money shopping Target. 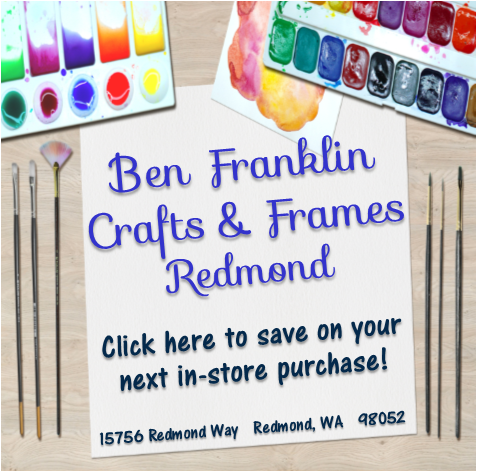 you can stack coupons and savings – how awesome is that!! I like that there are all sorts of little necessary things on there not just big items like electronics. I love the search feature! I like tat it is easy t use. There are so many great coupons on the app! I love the clothing offers. I love that you can stack coupons and discounts on the app. I like that you can save discounts and deals with the app. No clipping, cutting.. just SHOW it baby!! Love it! Target is a great place to shop and save money. I love that you can layer the promotions on other coupons. I also love the idea that I no longer have to cut out coupons and can see all the promotions right on my phone! I downloaded the app. Sounds like a no-brainer to me. I shop at Target at least once a week. Why not save extra money with this great free app? I think it’s great that you can stack with other coupons! a lot of stores don’t offer that! I’ve never used it but the fact that all the coupons are scanned just once at checkout is cool. I love how easy it is to find store coupons, and that you can stack them with a manufacturer coupon1 Go Target!! 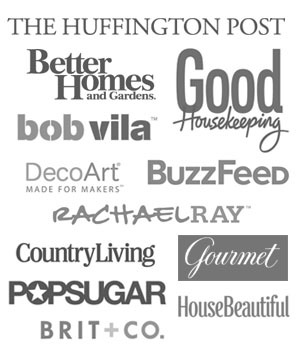 I hate clipping coupons, so I like that it is on the go, mobile and ready at all times. I always forget my coupons at home, this helps! I like that you can stack coupons. My favorite feature is that no printing is required! I love being able to just can my phone! I love that you can stack these coupons! I love being able to scan barcodes to see if the item has a discount. i like that you can use it to stack coupons. 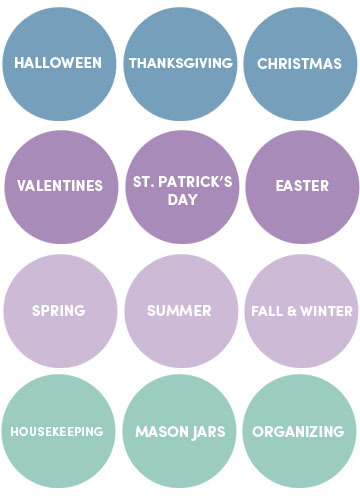 even though i am not great about couponing, i love the idea! I like the apparel deals. I like the sale alerts! Mobile coupons are so convenient! I like the barcode scanner. I like the coupon savings without having to print or cut out coupons. I like that you don’t have to print anything or carry anything extra. I love that you can stack coupons! I like the organization of the app! My favorite feature is the how organized it is and I can hit browse and search for coupons on my favorite products! I like that you can scan items and see if there is a deal on them! I like the index of offers. It helps me quickly find what I’ve got and the discount I get. My favorite feature of the Cartwheel is that you can scan an item to see if it’s on the Cartwheel as well. :) love the savings. You can see what coupons you have (unlike if you were to load it onto a club card), easily scannable. My fav-o-rite par in the scanning option…prevents me from buying all the things! I like that it is a mobile app so even if you forgot coupons and find something on clearance, you can add it on the spot and still save money. I like the mobile coupon that works for everything! I like that it updates each week with new savings. I love how it scans all the coupons you want to use at once! I love that you can personalize it to exactly what you shop for. I like that you can use it with other coupons too! That I can use it multiple times in a day! I love that you can scan barcodes to see if there is a voucher. That the coupons are right there on your phone with you when you’re shopping! I like that it’s sorted by store department, so I can search only what I’m looking for! My favorite part about the Cartwheel Coupon app is that it allows the Cartwheel coupons to be used in conjunction with Target and manufacturer coupons. 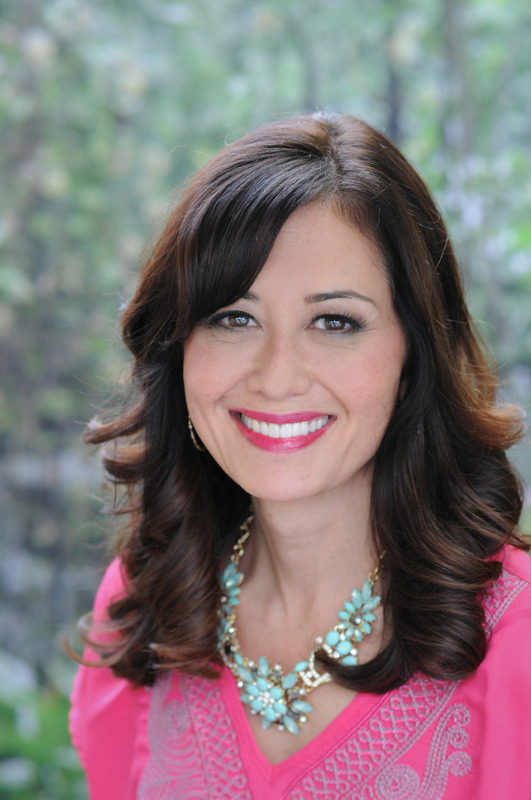 I have a 10 month old baby and every penny saved counts a lot in our household! Conveniently on phone so no need to print and cut coupons. I love that there’s no clipping coupons and having to remember to bring them to the store; they’re right there in the palm of your hand! I love how you can find great deals by stacking coupons. I have been using Cartwheel for a few months now. I love it! I love the mobile coupons! I like that the feature that allows one to stack coupons and get even more savings. Thanks for the chance to win! I LOVE the Cartwheel app!! I recently used found some cute clothes in the little girls department that were on clearance and had additional savings on the Cartwheel app. ;) Target is awesome! I love that it alerts you to what’s on sale. I like that you can scan an item to see if there is a coupon for that item. thank you!! My favorite feature is that you can scan an item to see if there a matching coupon. Love that there are over 700 offers! Thats amazing! Lovre tht you can use Catwheel even if you don’t have a smartphone. Just print out for them to scan at Target. Favorite feature is the ease of use. I love that you can scan barcodes! Who doesn’t like to be a little kid again pretending to ring up items. But then save money too!! I like how many coupons are offered. 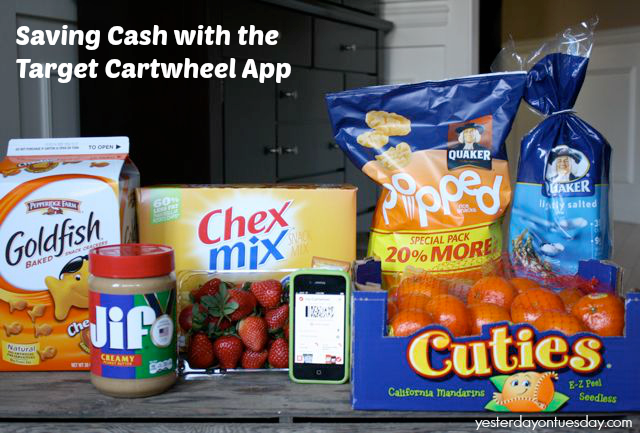 Any new app that saves me money at checkout is great and I want to start using this Cartwheel App as soon as I can. I like that I can scan with my phone. I love you can stack coupons using it! I love that you can see your savings before your trip to plan ahead. my favorite feature is that it’s right on my phone – I love this mobile app and i love how many coupons it has! that it’s so easy to use! I like that I am able to use it on my desktop and laptop and not just my cell phone. I like you can stack coupons. My favorite feature is the barcode scanner! I love the simplicity, just bring your phone! Something I am definitely going to try. I would use the coupons on the Cartwheel App to buy groceries. I like that you can load the coupons at home. Sometimes I’m in a hurry and this saves time. My favorite feature of the app is that you can stack coupons! That’s the only way to shop! I like how easy it is to use the coupons! 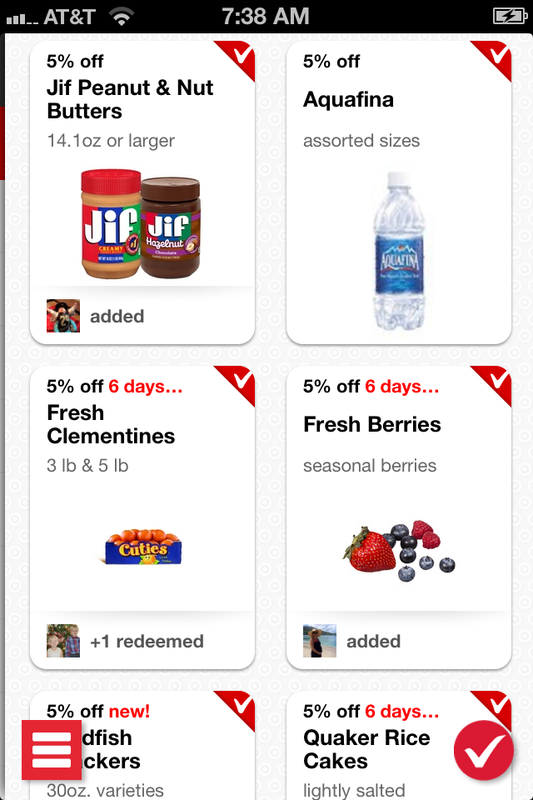 I use Cartwheel for the food offers! Cartwheel and Coupons, a great mix. My favorite feature of the app is that they have so many coupons to choose from, with that many you’re bound to find a good number of things you will be getting a savings on. 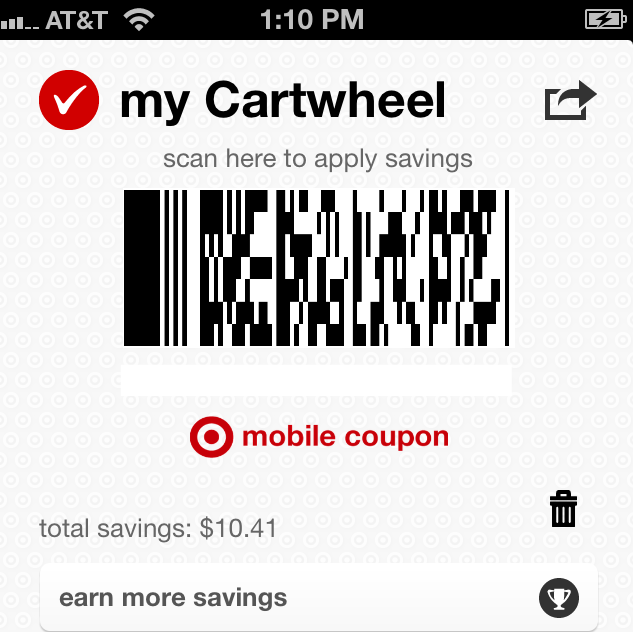 my favorite feature of the cartwheel app is that i can save even more money at target with this cool app. I like the coupons feature. My favorite feature is being able to scan an item for coupons while you’re shopping! i think the stacking feature is great- the savings could really pile up! I haven’t used it but it sounds like there’s excellent discounts. I like they have so many coupons and ways to save.